HomeHow Do Dream Characters Come to Be? How Do Emerging Potentials Come to Be? “It’s my turn now. Get out! How can a Clearly Prepersonal and Irrational Process Produce Transpersonal Results? On the surface of things, there is nothing rational, much less transpersonal, about interviewing dream characters like a monster or angel and the personifications of waking life issues, such as a pit that is a metaphor for some depression you feel. Integral Deep Listening (IDL) refers to these together as “emerging potentials.”In either case, dreaming or waking, how is it that we experience both amazing autonomy yet wisdom, support, and nurturance from so many interviewed emerging potentials? Why do they not take over? Why do they not fragment the sense of self that we have worked so hard to create? Why should the whimsical and arbitrary expression of sadness, first as the color green and then as a salamander have any relationship whatsoever to anything? Why should we take precious time listening to the perspectives of some obvious fabrication of the mind? Will that not simply lead us into more dreamlike delusion, samsara, maya, and suffering rather than out of it? IDL is a counterintuitive approach to Dream Yoga. It does not seek the instruction of departed masters or the guidance of the White Brotherhood. It shows no preference for saints over toilet seats, for angels over Kreacher, the house elf. To understand emerging potentials it is important to understand their differences from both others and wake-up calls. “Others,” whether appearing in waking life, dreams or altered states as entities, objects or processes, may or may not function as wake-up calls or as emerging potentials. For example, when we normally see or think about another person or a glass of water it does not evoke transformation, nor do we usually want it to. We want others to act in customary, expected ways, to give us correct change, to stay on their side of the road, to remember their appointments, to be filled with water, not suntan lotion. Most of the time, even when we have an accident, illness, nightmare or crisis, it does not function as a wake-up call. Instead, we deal with it as best we can, are happy to awaken out of it, pick up the pieces of our lives and forget about it as quickly as possible. If we do not the memories are generally dysfunctional or even pathological; we remember as a form of vigilance out of fear of a repetition or to reinforce a life script of victimization. We go back to sleep, dreaming and sleepwalking; we do not experience most people and objects, whether awake or dreaming as wake-up calls. Similarly, “others” do not typically function as emerging potentials, which refer to others and events that are perceived as wake-up calls and then transformed into perspectives that include yet transcend our own. IDL uses this term broadly, in the sense that anything or anyone can serve as an emerging potential if seen and approached in a context that includes significant empathy. It also uses it in the more narrow and specific sense of a dream element or personification of a life issue that we become in the interviewing process or later, after an interview, to evoke its perspective in our thought, feelings and actions. Emerging potentials include our own perspectives include our own in that they “know us” at least as well as we know ourselves since they include our waking identity; they transcend our own perspectives in that they add their own perspective to ours. Clearly, all acknowledged wake-up calls do not elicit this depth or quality of response and most encounter with the “other” even less so. How Does Chaos Theory Help Explain the Dream of Reality? Concepts from the field of chaos theory throw light on why identification with emerging potentials expands identity and causes us to wake up. IDL draws fascinating and helpful insights from Rene Thom’s catastrophe theory, Edward Lorenz’s discovery of the first of a series of chaotic attractors, and Mendel Mandelbrot’s depictions of fractal geometry. While such terminology comes from systems theory, mathematics, and the physical sciences, and most properly relates to the external collective quadrant or the functioning of systems, it is applied by IDL to all four quadrants of the human holon. Systems and probability theory, physics, and mathematics tend to talk about things as processes possessing more or less energy. Such terminology not only gets us away from static absolutisms and into the real world; it can also help us to move to the first transpersonal rung of the developmental ladder. It does so by talking about the energy that makes up things and concepts and substances rather than focusing on the form of a thing. For example, we commonly assume hands are solid objects. While this approach works for common sense tasks, a hand is also made up of molecules, atoms, and energy. This alternative way of thinking about a hand produces new meanings and understandings. Energy medicine tends to approach healing from this energy level of understanding, although it is applied to all memes below the energic with good effect. The first transpersonal level, which experiences oneness with life as energy and freedom, has been called psychic by Wilber and “the path of the yogis” by various sources. IDL refers to the early transpersonal developmental level as energic, because unification with the energy underlying the natural order is fundamental to this stage, psychic abilities may or may not accompany stable functioning at this meme and because attempts to develop psychic abilities and yogic powers have not proven to be particular use for escaping drama or generating balanced development. The perspective of the lower transpersonal is experiential and uses a model of reality that is based on energy, not on forms or “things.” This is because forms imply permanence and reality while their departure implies death. But from an energic perspective, there are neither forms nor deaths, only the endless transitions of processes. Chaos theory provides a way to understand human experience that is in harmony with such realities as well as with the indeterminate nature of experience which is foundational to post-Newtonian quantum physics. What are chaotic attractors and what do they have to do with waking up? The concept of attractors comes from chaos theory, which views many steady state phenomena, that is “forms,” like your hand, dream characters and your sense of self, as actually composed of fluctuations between order and disorder. Normal sensory perception is a stabilized “average” of fluctuating bits of data, as is the picture on a television screen and the sound coming from a radio. An “attractor” is a state or pattern of activity toward which a system tends to slide of its own accord. For example, consciousness and drowsiness fluctuate when we get sleepy. After being awake for some eighteen hours, consciousness tends to slide toward sleep. After a period of deep sleep, consciousness tends to slide toward dreaming. At the end of the longest dream cycle, consciousness tends to slide toward waking. Think of an attractor as a “tuner,” a device that shapes information signals toward a desired state. For example, the multi-faceted eye of a bee “tunes” sensory data to a completely different visual input than do human eyes. There are chaotic and static attractors. 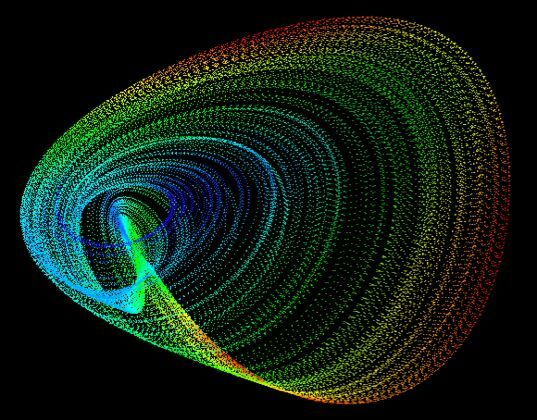 Chaotic attractors are complex states of probability that when depicted, look like funnels or whirlpools. They are states of probability in that at any one moment one can either measure their location or momentum, as a particle or as a wave, but not both. The power of this model is that it forces the mind to contemplate a purely energic, non-physical model of reality that has no substance or “real” form whatsoever. It defies a basic premise of Aristotle’s logic, upon which the personal level of development depends and upon which Western empiricism has built its imposing contributions. This is the “Law of the Excluded Middle,” which says that something either is or is not, but cannot be both. What Heisenberg, quantum physics, and chaos theory put in its place is something more akin to the fourfold negation of Nagarjuna’s Madhyamika, the summit of Buddhist expressions of the nature of reality: A thing or idea neither is, nor is it not. It neither is and is not – both at the same time. It neither is not nor is it not. Nagarjuna’s perspective is thoroughly transpersonal and trans-rational. It does not assume beingness or the reality of substances as does the Law of the Excluded Middle. It says not only that life exists between the states of beingness and non-beingness, but that everything that exists occupies that indeterminent place. While this drives the rational mind mad, it opens consciousness up to the contemplation of sunyata, a state of emptiness of all forms, all formulations, and the ground of all experience. An analogy that makes this understanding more accessible is to existence in the present, the here and now, rather than in the past or future. Nagarjuna drew out the logical conclusions of the “Middle Way” of Gautama, and they point to an interdependent, formless, transpersonal worldview, a perspective that chaos theory and its attractors also support. A form, individual or process on the edge or threshold of an attractor whirlpool, which exists as energy expressed as various states of probability, transforms relatively slowly. If you throw a coin or a marble into a large plastic funnel you will notice the same thing happening. First the coin moves lazily around the outer edge of the funnel, but with each revolution it is drawn down faster and faster around the narrowing rim until it is “attracted” to its point of maximum stability, called a static attractor. A glass spun on its edge will do the same thing. It will oscillate faster and faster, “attracted” to its point of maximum stability. Gyroscopes that spin with internal stability are static attractors. They are so stable that they are used as the core of satellite orientation systems. Paradoxically, non-reality and indeterminancy give rise to very stable experiences of reality and probability. When you are very drowsy, it is normal to enter the hypnogogic state which fades quickly into deep sleep, the point of maximum stability for consciousness at that moment. When you are lucid dreaming you are maintaining your attention balanced on the rim of an attractor whirlpool, like a gyroscope that is balanced as a static attractor. When you fall out of that attractor you move into one of three others, spinning down into one or another of the static attractors we call the states of deep sleep, dreaming and waking. Chaotic and static attractors are therefore two poles of attraction, or the same phenomena looked at from different perspectives. For example a tornado is obviously possesses the characteristics of a chaotic attractor, but it also contains elements of static attractors in the calmness of its center and its relative stability. 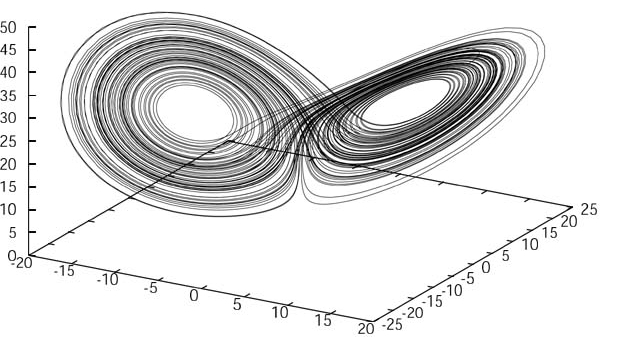 Chaotic attractors have irregular rhythms. Examples include weather patterns, stock fluctuations, and the appearance of characters and themes in dreams. While all three of these examples contain patterns that can be charted, in the final analysis, complex states of probability keep actual experience indeterminate and creatively volatile. Consider your normal, waking identity at this moment as a “basin” or “funnel” of attraction. This means that you are perceiving and organizing your thoughts, feelings, and actions right now in a way that is congruent with your normal waking consciousness. When you are exposed to a new idea, you categorize it according to structures of your waking attractor basin rather than with your dreaming consciousness or deep sleep consciousness. This strengthens your waking sense of self while minimizing, ignoring, or discounting your dreaming sense of self, the perceptual frameworks of other aspects of yourself, the priorities of life or the reality structuring innate to your sleeping consciousness. Other people are, in relationship to your current waking identity, other chaotic attractors. They organize their own feelings, thoughts, and actions in ways that are congruent with their normal waking attractor basin, which is different from your own. A state of consciousness like dreaming is a good example of an attractor. Who knows exactly what sort of dream will arise? Sounds or lights in the environment of a dreaming person are routinely woven into dream imagery in such a way that dreaming continues, underlying the inherent stability of dreaming as a chaotic attractor, because ongoing experience in the environment is interpreted in such a way that it maintains the attractor basin of dreaming. While most dreams are reflections of chaotic attractors, there is at least one category of dream that is a depiction of the power of an underlying static attractor. Post traumatic stress disorder nightmares are fear-based fixations. These highly predictable repetitive dreams appear to be the products of very stable static attractors, which are much more cohesive and predictable than the majority of dreams, which are more likely depictions of underlying chaotic attractor states of consciousness. This is because dreams reflect predictable themes and predictable reactions by waking identity while remaining unpredictable in the particular depictions of those themes and associated dream characters. Therefore, we can see how repetitive dreams are also examples of relatively stable chaotic attractors. What happens when you empathize with another person, dream character or perspective? To fully identify with another person’s experience is to move out of your self-organizing basin of attraction and into theirs. This is rarely done, out of fear of loss of one’s sense of self or inability to empathize, but when it is done, it can be transformative because you have entered, to one degree or another, an entirely different system of probabilities. You wake up to possibilities that did not exist in your attractor basin. Similarly, when you identify with an emerging potential that is the personification of a life issue or a dream character you move from the attractor basin of your waking self-sense into that of some different perspective that is oriented around a world view or set of probabilities that is more or less different from your own. You know that this is the case by the considerable differences in preferences that you express from that other perspective. Of course, one can pretend and one can have partial identification. In both of these cases one has not fully identified with the attractor basin of another. The general rule of thumb is that less identification, or full identification with a perspective that is similar to or highly compatible with your own is minimally transformative but relatively stable, since it reflects the static attractor of your normal waking sense of self. However, more or full identification with a perspective that is radically different or incompatible with your own is highly transformative but extremely volatile and chaotic, since it reflects the chaotic attractor of highly dissimilar probabilities. This is why IDL emphasizes multiple ongoing interviews; some are less transformative; those which are more transformative are the most volatile and evanescent because their basins are expressions of probabilities that are widely divergent from those of your normal waking static attractor basin. What does speculation about chaotic attractor basins have to do with my awakening? Chaotic attractor basins provide a fun, new way to talk about some very ancient ideas. They address the nature of the spiraling, swirling energy sheaths or koshas discussed by Hindu Vedanta, the chakras explored in various yogas, the spiritual bodies explained in the spiritualist traditions of Blevatsky, Ledbetter, Besant, and Prophet, the energy bodies of contemporary energy medicine, and the levels of consciousness addressed by the perennial philosophy, which are largely recapitulated and integrated in the works of Ken Wilber. Objectivity, or cultivating the witness, is largely a matter of waking up to who and what we are in relation to the rest of experience. While the cognitive developmental line leads, in that it creates the perceptual contexts that structure the development of the other lines, understanding awakening is not the same as stabilized existence at a selfless level of development. That requires the transpersonal evolution of the self-sense, empathy and ethical development. However, cognitive development is an important start. To that end, we explore better and broader models to help us detach from cultural worldviews that keep us asleep and dreaming. The idea of attractor basins is a broad, energy-based description of the relationship between waking, dreaming, and personal development. As such, it contributes to a vision logic, or multi-perspectival, understanding of dreaming and lucidity at the doorway to the transcendence of identification with any self whatsoever. What do chaotic attractors have to do with altered states of consciousness? Consciousness attractor basins co-exist within one another, rather like Matryoshka, those Russian wooden dolls that nestle one within the other. We see this in human development. From birth until about the age of two, consciousness is associated not only with the early pre-personal physical and emotional states but with Delta brainwave states of 0.5–4 cycles per second. These very slow, low amplitude brainwaves are also associated with deep sleep consciousness and the deep sleep attractor basin. From two until six consciousness is most strongly identified with late personal egotism and the development of an early personal social sense. It is also identified with Theta brainwave states of 6-8 cps, which are associated with dreaming and the suggestibility of hypnosis. One might say that the dreaming attractor basin arises out of or is nestled within the deep sleep attractor basin. However, it transcends and includes deep sleep consciousness because its perspectives and competencies arise out of and express far greater competencies. Once developed, the dreaming attractor basin includes and transcends the deep sleep attractor basin as a subset. Perhaps we can visualize this as a subset of probabilities that we “fall into” when our brain waves move toward Delta. From six until about twelve the predominant brainwave state is Alpha, 8–12 cps. It is associated with an emergent personal self-sense. At around twelve the predominant brainwave pattern is Beta, “active or focused consciousness.” This is a fully-formed, distinct waking attractor basin, which transcends and includes the other three, yet operates “within” their supportive structures. We know this is the case because every night we “fall” back into deep sleep and dream sleep. Consciousness recapitulates ontogeny, just as ontogeny to some extent recapitulates phylogeny. Lucid dreaming provides a further iteration of this developmental progression. Associated with brainwave states of Gamma, or between 25 and 100 Hz, although 40 is typical, Gamma is also seen in advanced meditators and hypothesized to be associated with highly coherent and integrated brain states. When you get knocked out or go unconscious, imagine that your waking attractor basin disappears into the wall of the physical body attractor basin in which it spins. One set of “higher frequency” probabilities has been replaced or overwhelmed by a more stable set of “lower frequency” probabilities. When you go to sleep at night, this is what happens at first. You quickly descend into Delta brain wave deep sleep. This deep sleep attractor basin is, for most people, synonymous with the physical attractor basin. In NDEs (near death experiences), the “tunnel” that is often reported, may be the dream (subtle) or even the deep sleep (causal) attractor basin. In OOBEs (out of body experiences) NDEs and mystical experiences your sense of self, which is normally anchored within both your waking attractor basin and your physical attractor basin, leaves the “wall” of your physical attractor basin while remaining in your waking attractor basin. While your identity remains identified with your waking attractor basin your experience is no longer derived from or dependent upon the probabilities of your physical attractor basin. As a result, probabilities are thrown wide open while the probabilities that create your world view and therefore your interpretations of your experience, remain stable. What about lucid dreaming? Imagine that while in a dream you recognize that you are no longer in the waking attractor basin; you are in a completely different one that is governed by different, unknown rules. With the knowledge that you are no longer bound by the rules of your normal waking attractor basin you can choose what you will do and how you will be within this “new” attractor basin. The wisdom of this choice is another matter altogether. IDL assumes that since waking identity is a subset of dream consciousness, it needs to learn from the content of the dream attractor basin, not extend control over it, considering the very mixed results of such experiments in control that humans have in their individual, cultural, social, and environmental relationships. Alcohol and drugs create chemically induced partial detachments from the normal waking self-sense. What takes its place are emotional, cognitive, and behavioral subsets of this waking self-sense that are normally controlled or submerged. These are usually patterns learned at an earlier age that have been transcended and included in more sophisticated patterns. Without “adult supervision” these come to the fore. It is as if the normal “parent” that is in charge of consciousness goes to sleep. The self-sense remains tethered to the physical attractor basin but functions with passengers, not pilots, in charge of the spacecraft. LSD and hallucinogin-inspired altered states are chemically induced detachments from the physical attractor basin in such a way that an awareness of the underlying energy that creates all attractor basins can, on occasion, be experienced. Or they can result in a mere partial detachment from the normal waking self-sense, as with alcohol or drugs. Finally, they can result in a conscious movement into the dream attractor basin, with problematic contact with reality. Mystical experiences of bliss and clear awareness also involve detachment from the physical attractor basin, but are not induced by drugs. If they involve trance, the waking attractor basin is gone for the moment; in its place is some combination of the three transpersonal bodies, depending on whether the experience is primarily about control of energy, bliss, or consciousness itself. If the experience does not involve trance, the waking attractor basin participates in an experience that is not tethered to the physical or dream attractor basins. Consequently, there is a greater ability to integrate experiences of formlessness into waking identity. What happens in mediumship and possession? When states of trance mediumship, possession and decompensation are approached from the perspective of chaos theory you again have a separation your waking attractor from the “wall” of your physical attractor. However, in addition, your identity with your waking attractor itself is suspended in favor of identification with or “attachment to the wall of” a coherent but radically “other” set of probabilities associated with an attractor basin that takes the place of your normal waking sense of self. How are chaotic attractors like the emerging potentials we encounter in dreams and in waking life? Some complex systems, particularly those that define waking, sleeping, and dreaming experience, appear to be poised on the edge of chaos. They shift back and forth between predictable behavior and chaotic activity. You can see this fluidity most clearly in children. In fact, a cynic might say that one of the major results of socialization is to turn a child chaotic attractor into an adult static one. A “liminal” is the edge between one attractor basin and another. These “event horizons” are to be appreciated and cultivated instead of feared and ignored, as is generally the case. These are states of chaos that is ripe with creative and evolutionary potential. Such liminals, or chaotic threshold states, exist within your dreams between you and dream characters. Let’s say that a toadstool appears conspicuously in one of your dreams. When you awaken, you are curious about it, so you choose to “become” the toadstool. To the extent that you successfully get into role and become the toadstool, you approach both your dream and waking experience from the perspective of the toadstool. Such an effort tends to shift consciousness out of your normal waking attractor basin and into that of the “toadstool consciousness” attractor basin. Obviously the toadstool is a fantasy that is emotionally and visually evocative of a unique perceptual context that is more or less like your own. The perspective of the toadstool may be no different than your own waking one, in which case it is called a “dream self surrogate,” because its perspective mirrors that of your own in the dream. In such a case, its attractor basin would not be much different from your own. You would end up looking at the world pretty much as you already do. The toadstool may, however, perceive the world in ways that are profoundly at variance with those routinely taken by your waking identity. If so, then for at least the duration of your period of identification, your identity shifts to that of the toadstool chaotic attractor basin. This creates a tendency toward the mergence of these two attractor basins (waking and toadstool), an experience that fundamentally expands identity. Think of it as your waking attractor basin expanding in width and depth to a smaller or greater degree for a shorter or longer period of time, depending on the intensity of identification and the differential between the perspective of the toadstool and your own. This also means that your sense of self within the dream attractor basin has adopted an expanded awareness, causing it to interact with other emerging potentials within the attractor basin, as well as forces from outside, in a less reactive, more inclusive way. Why would I want to move toward chaos by identifying with something stupid like a toadstool or an alarm clock? The significance of such an expansion is not to be underestimated. Because of the strong magnetic attraction of your waking identity, which interprets all of your experiences in terms of its sphere of influence, most events in your life will tend to validate your conscious sense of self, including your world view, and your waking agenda. You might say that you pull everything into your waking attractor basin instead of expanding it. Your waking attractor basin becomes a static attractor instead of a chaotic attractor, and this means the avoidance of antithesis, without which the developmental dialectic cannot proceed. This creates rigidity and stagnation in a self-sense that no longer serves the needs of other chaotic attractors which together manifest energy in form. Development slows down. Waking identity becomes overly structured and lacking in the flexibility that real growth and creative adaptation require. This will be the case regardless of how much lucid dreaming or meditation that you do, if those activities are undertaken within the perceptual framework of your waking attractor basin, as they normally are. However, when you identify with an emerging potential like the toadstool, you disidentify with your normal, habitual sense of who you are. You leave your “normal” attractor basin and cross a liminal or threshold into a different one with its own probabilities and laws of attraction. This occurs regardless of your level of development, although your dominant meme continues to determine what you make of the experience. This is not a process that you can outgrow, regardless of where you are in your own hero’s journey. Each time that you merge with an emerging potential, regardless of how absurd or irrelevant it seems to be, you will expand your sense of self to some degree. Your self sense will become a broader, wider yet thinner attractor basin, in the sense that its differentiation or liminal separating and distinguishing it from other chaotic attractor basins becomes flatter, less pronounced, less steep with a slower, more gradual transition from one to another. You waking attractor basin will become more diaphanous and take on more of the qualities and characteristics of life itself: the formless manifestation of core intentions and qualities that do not die. How can chaos theory help us to understand how life is like a dream? Chaos theory provides an interesting model to help explain why weird, dreamlike events happen to us in our waking lives. Jung coined the term “synchronicity” to describe some of them, when events are related coincidentally, but not by time or space, such as when a friend calls just as you were thinking about them or you run into your cousin on a trip to Namibia. Imagine you are an iridescent, clear tornado of energy that reflects all the colors of the rainbow and changes its height and width as it spins. 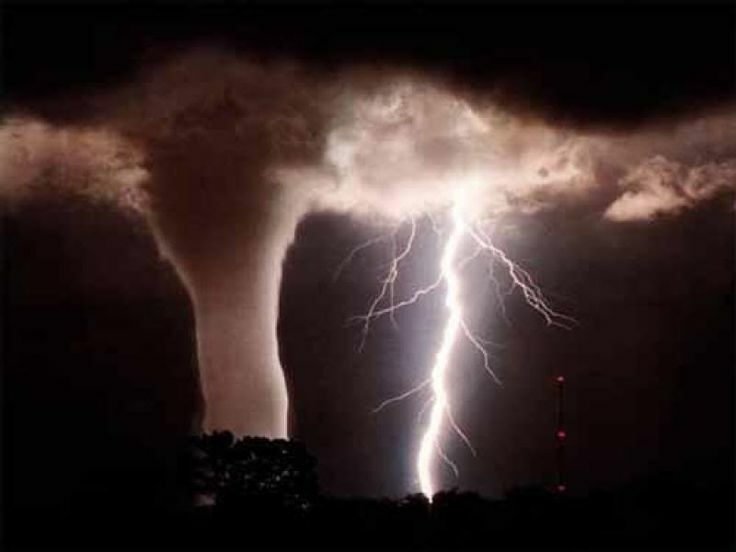 Your spinning, dancing, gyroscopic self-sense contains all sorts of smaller tornados dancing around inside it, connected to the broad, high interior surface of your self-sense near the bottom of each smaller spinning tornado-funnel. Some of these smaller, interior tornados may float up a long way from the inner surface of your funnel. Others may spend their lives out of sight, nestled deeply within the thick, spinning wall of your self-sense. These tornados change color as they dance and spiral up and down inside of “you,” becoming larger and smaller, appearing and disappearing. These microcosmic chaotic attractors are your thoughts, your feelings, and your physical sensations. They are largely conditioned by their existence as subsets existing within the larger chaotic basin called your self-sense. While they do not exist apart from the larger basin in which they live, the energy of which they are comprised does. Their meaning and purpose is provided by their existence within the larger basin of your self-sense. Its probabilities condition and limit their range of probabilities and therefore your range of expression and transformation. Your body is another spinning, funnel-like chaotic attractor basin out of which your self-sense evolved as a larger, less dense tornado, with each representing a range of probabilities that condition the other. Your self-sense can be enmeshed in the wall of the physical attractor basin or it can spin freely and largely separated from it. Sometimes you dance around deep down inside the physical attractor basin, which is where you started out, as an infant. Sometimes your sense of self is almost completely disconnected with it, as happens when you get lost in a movie or good book, astrally project, or meditate deeply. When you die, the coherence of your physical attractor basin dissolves within the attractor basin out of which it and all other physical attractor basins arise. Its probabilities cease to exist and no longer condition other attractor basins. The consciousness of who you are continues to exist to the extent that its probabilities are not contingent on those of the physical attractor basin. In truth, we do not know, with theories running from complete interdependence, meaning interdependent dissolution, to complete autonomy. Neither extreme appear to be realistic to IDL; these attractor basins appear to be largely but not completely interdependent. While that self-sense dissipates, a broader set of probabilities continues to exist as potentials within the larger attractor basin out of which individual physical attractor basins arise. Whether these broader sets of probabilities retain enough individuality to constitute a self is debatable. From the perspective of life, as reflected in the comments of interviewed emerging potentials, it does not seem to be important. What are these other attractor basins? Your waking attractor basin is different than your self sense because it transcends and includes it both macrocosmically with cultural, social and external sensory attractor basins that are contextual as well and microcosmically with internal sensory attractor basins that are also contextual, despite the fact that your self sense arose out of it. Your sense of self spends the majority of its conscious existence spinning and dancing within the parameters set by existence within this chaotic attractor basin called waking awareness. Its range of probabilities generates your perceived external world. It contains all the forms that impinge upon your awareness while you are awake. Each of the forms dancing within it is made out of spinning spirals of energy, just like you are. They each have their own internal organization. Like a gyroscope, each vibrating and spinning constellation of energy tends to maintain its own stability and integrity over time, giving it a unique form, like a snowflake, as well as individual character, like each dog possesses. As a chaotic attractor basin shaped like a hurricane that is spinning constantly at high speed as it moves across the surface of the waking attractor basin, your self-sense is surrounded by countless chaotic attractor basins that are doing the same. These are the people, animals, buildings, landscapes, and skies that populate your waking world. Some of these, like the land, ocean, and sky, are remarkably stable. Others, like lightening, rivers, and crickets, are short-lived or change quickly. Now imagine that this waking attractor basin is itself a multi-colored tornado of energy that is spinning somewhere along the interior wall of a larger chaotic attractor basin called dreaming consciousness. It is not bound by the same structures that condition the waking chaotic attractor basin spinning within it. For example, it does not exist in time or space and it is not conditioned by conscience or social scripting in the ways or to the degree that your sense of self is. This dreaming attractor basin wholly contains the smaller waking attractor basin but is only rarely experienced by your self-sense attractor basin because you remain so invested in your spinning and orientation within your waking attractor basin. There are times, however, probably determined by forms of intention of various other attractor basins that quite transcend that of our little whirling self-sense, when the floor of the waking attractor basin merges with the wall of the great underlying dream attractor basin and the laws of time and space that normally apply melt away. These are moments or occurrences of synchronicity. Who is to say that these are not happening continuously and our waking awareness only catches them occasionally? What happens to these attractor basins when I dream or fall deeply asleep? As you drift off to sleep, imagine that your hurricane self-sense is slowly drifting upward toward the threshold or edge of its waking attractor basin and crossing over into the larger dreaming chaotic attractor basin that contains both. Like a skier crossing from one watershed to another, the terrain looks the same, but now you are skiing without the aid or security of gravity or marked ski runs! When you dream, you assume that you are still experiencing life in the context of your habitual waking chaotic attractor, but this is a mistake! When you wake up in a dream you are realizing that the rules have changed, because you are skiing in a different chaotic attractor basin with different probabilities that condition your experience. You may have fun taking advantage of what you can do when you can ski without gravity or time, or you can just let your experience unfold and go along for the ride, watching and experiencing. This is one way of describing the difference between lucid and pellucid dreaming. Very few skiers consciously enter the broader watershed or basin that encloses the dreaming chaotic basin, called the deep sleep chaotic attractor basin. It has no form at all, yet it is different from the basins it contains and provides a grounding or potential out of which all experience and all form arises. Meditation may be thought of as practice witnessing any and all attractor basins. This is a paradox, because we have seen how these larger, contextual attractor basins function at lower cycles per second while your self-sense, if it is to maintain its awareness within them, needs to ramp up its amplitude toward gamma, or 40 hz. How can I learn to be conscious in all of these states? Your self-sense attractor basin can become aware in all of these states by learning to simply merge or identify with these larger basins while remaining aware that it is doing so. This is easier said than done, however, as any lucid dreamer or meditator will tell you, and meditation is largely about learning the attentional stability and objectivity that is required to maintain a conscious self-sense within these other attractor basins. This is made more difficult if you have not had experiences of “skiing” in these larger attractor basins. It would be like striking out on a journey without a map, on faith. Or perhaps you have a partial map, or perhaps you trust the stories you’ve heard. But once you’ve caught a distant glimpse of your destination or met someone who is coming back from that realm, your confidence and determination are much increased. This is a major purpose of IDL interviewing. When you do so you take on the probabilities associated with the perspectives and world views intrinsic to these contextual, broader attractor basins. It is not unusual to be presented in dreams and in interviews with feelings or issues with emerging potentials that are personifications of aspects of these larger attractor basins. For example, they may exhibit characteristics of the subtle, causal or non-dual. When you become them you have a direct experience of where you are going. This makes it much easier for you to know where you want to head in your development into greater lucidity.